After reaching Srinagar or Pahalgaon in Jammu & Kashmir State, Amarnath Cave shrine can be reached on foot, pony or partly by helicopter service. Srinagar, the capital of Jammu & Kashmir, can be reached by Air, Rail or Road. Srinagar, the capital city is well connected with most Indian cities by Air. There are daily flights from Jammu, Delhi and Mumbai and bi-weekly flights to Chandigarh and Leh. 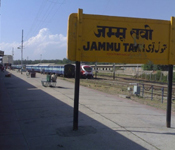 Jammu is the last rail head in Jammu & Kashmir. It is well connected by rail and road to the rest of the country. Jammu and Srinagar are both well connected by road. Public Transport buses run by the State Transport Corporation connects these cities with small and big towns of the state and also neighboring states. Private taxies are also to carry pilgrims to Pahalgaon or Baaltal to commence their pilgrimage. 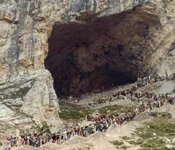 The Holy Amarnath Cave can be reached from Pahalgaon or from Baaltal. Baaltal route is shorter but more difficult than the Pahalgaon-Chandanwadi route which is longer but not as steep. Almost 150000 pilgrims take this pilgrimage annually. In spite of the physical hardships borne by pilgrims, every year the number of pilgrims is showing a steady increase. The traditional route takes you from Jammu to Pahalgam at a distance of 315 kms by road in a Bus, Taxi or private vehicle. One can also come to Pahalgaon from Srinagar.